The number of air passengers affected by delays or cancellations increased by 2 million in 2017, to reach 16.1 million people. Almost €6.2 billion compensation could be paid by the airlines according to the 261/2004 regulation. The 5 biggest active airlines in Europe are the least reliables; and most of the low-cost airlines stand out by their punctuality. The compensation rate, cumulating +3h delay and cancelation rates, raised from 1.46% in 2016 to 1.58% in 2017. The percentage of eligible flights according to the 261/2004 regulation, and whose passenger can ask for a compensation, increased by +8.2% in 2017 in comparison with last year. This increase is particularly carried by the +3h delay rate, which reached 0.62% in 2017 (+20.6% vs. 2016). The cancellation rate remains relatively stable with 0.96% (+2% vs. 2016). The +1h delays, not taken into account in the compensation rate calculation, continue to increase by almost +8% in comparison to 2016. And affects 4.13% of the flights. The air passengers are still few to know about the legal provisions of the 261/2004 regulation which allows them to get an compensation up to €600 per passenger for denied boarding, cancellation or important delays. However, they are more and more to be able to claim. The compensation rate increase, due to the air operations quality deterioration, is amplified by the increase of air passengers in Europe. RefundMyTicket estimates that in 2017, more than 1.02 billion passengers travelled in Europe, versus 970 million in 2016  and 918 million in 2015 . This double increase led to a significant growth of passengers affected by delays and cancelations, and who are eligible to get a compensation: 16.1 million this year, versus 14.1 million in 2016. With an average compensation of €385 per passenger, €6.2 billion could be claimed to the airlines for the year 2017. An ongoing trend explained by the constant increase since 2014 in the number of eligible passengers for delayed or canceled flights (overbooking excluded because it is complicated to estimate reliably). It increased by about +15% (approximately 2 million more passengers every year), or +53.3% in 3 years. In the Top 30 most active airlines in Europe, the first 5 are part of the “bad students”, even for the canceled and +1h or +3h delayed flights. The highest compensation rate is attributed to Virgin Atlantic with 2.63%. KLM, Lufthansa and Air France don’t manage it better with respective compensation rates as follows: 2.46%, 2.11% and 2.04%. 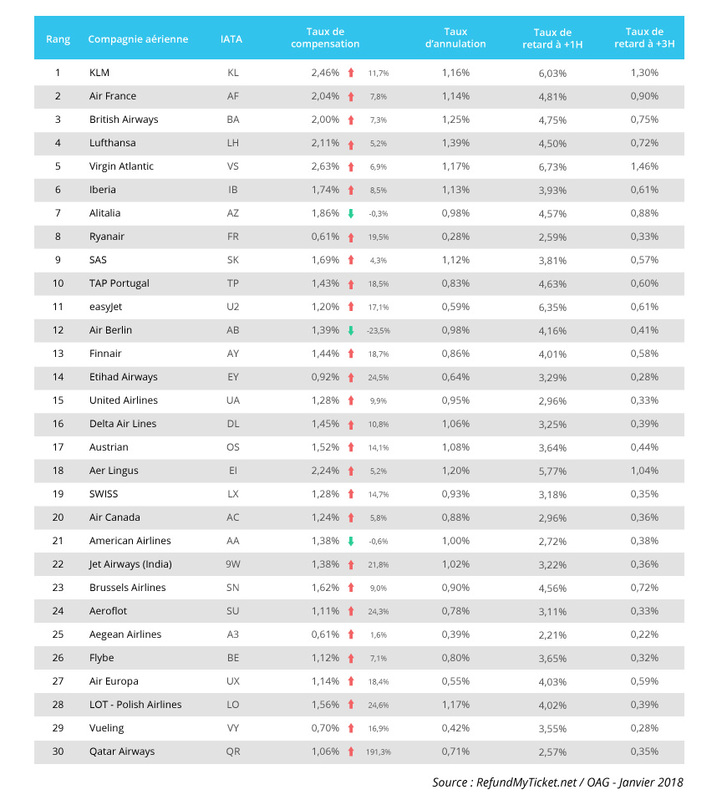 Inversely, Ryanair, despite thousands of cancellation scandal last September, overperforms the whole Top 30 airlines. It has the smallest compensation rate: 0.61%, tied to Aegian Airline. The biggest worsening of the operation reliability is registered by Alitalia, which displays a compensation rate of 1.86%, rising by +55.1% in comparison with 2016. Unsurprising results as the airline is facing a legal redress. KLM and Virgin Atlantic stand out again with their bad results, with an increasing compensation rate of +45.9% and +44.6% compared to 2016. On the contrary, Brussels airlines seems to be the airline which most worked to better its operations. Because its compensation rate 1.62%, fell by -48.6%, the most important drop of our ranking. However, it seems that it might be due to a return to normalcy. Because the Belgian airline suffered the most from the Bruxelles airport shutdown after the terrorist attacks. Aegian Airline and Vueling also display a sharp increase of their operational performances (compensation rate of 0.61% and 0.70%, respectively decreasing by -43.8% and -39.7%). United Airlines also acts as a “good student”, sensibly bettering its operational performances compared to last year (compensation rate of 1.62%, declining by -32.7% compared to 2016).